Giveaway Time for 9 to 5: The Musical at the Straz Center Tomorrow!!! Hey there guys! Jerm here with some more trivia for ya! And yes you know what that means... when Jerm has trivia you win tickets!If you didn&apos;t already know it, 9 to 5: The Musical will be in Tampa from Oct. 26-31, and as always Jerm has you covered! 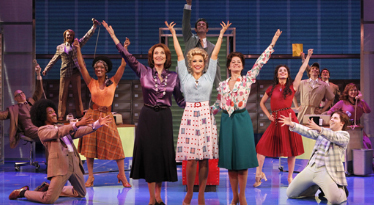 9 to 5: The Musical is a hilarious story of friendship and revenge in the Rolodex era. This new musical comedy, direct from Broadway, is based on the hit movie and features DOLLY PARTON&apos;s original hit title song along with her new Tony Award® -and Grammy-nominated score. 9 to 5: The Musical tells the story of three unlikely friends who conspire to take control of their company and learn there&apos;s nothing they can&apos;t do - even in a man&apos;s world. Outrageous, thought-provoking and even a little romantic, 9 to 5: The Musical is about teaming up and taking care of business ... it&apos;s about getting credit and getting even ... and it&apos;s about to open in Tampa! I have two tickets for tomorrow nights performance, so here is your chance to win opening night tickets to what I am sure will be a great show! As always, here is a refresher on the way the giveaway will work. Instead of re-tweeting, just answer the question(s) on Twitter. If you are reading this on Facebook, just simply answer the question by making a comment to the Facebook post. Answers placed in the comments section of this blog will not count. Once you do that you will be entered in to win, as we will randomly draw one name total, and that person will have two tickets to this awesome event! For those of you playing on Twitter and who choose to re-tweet, it does indeed increase your chances of winning. True or False - In the original movie 1980 movie Nine to Five, Dolly Parton was cast, in what would be her first on screen role. Name the writer of the Original Screenplay for 9to5 The Musical? Name the former American Idol contestant currently playing the role of Doralee Rhodes? That&apos;s it guys, I suggest you get to answering! That&apos;s all for now, but stay tuned in for more updates on Tampa Bay area events and arts and culture in Tampa Bay updates from me!